“Excuse me, but there is a man with a guitar in the fridge,” said our little helper, rather anxiously. Well, yes, we probably should’ve told him about the man in the fridge. But really: don’t all cornershops keep a muso in their coldrooms? It makes stocking up so much more fun. OK. On a serious note (pun intended). The man serenading us in this unusually chilly recital is Jake Wilson. Some of you will have met him at the Peckham Literary Festival this year, wherein he spoke and sang about Scott’s voyage to the Antarctic. Thing is, Jake has written a wonderful, lyrical, moving album celebrating the lives and letters of the five fated explorers. And in just under a month’s time, he is due to join an Antarctic expedition to go and sing in Scott’s hut, whence the 1912 attempt on the pole set off. The mini concert will be recorded for a future podcast. 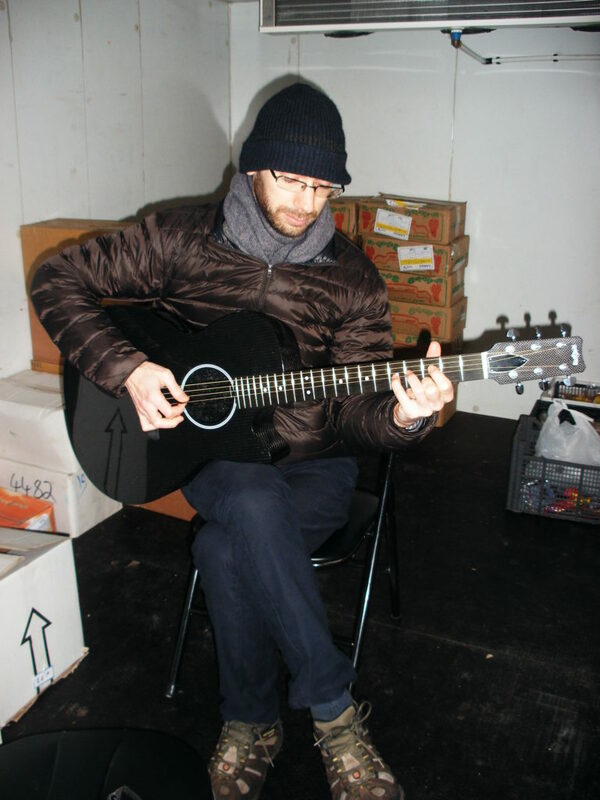 Jake has bought a graphite guitar, invested in some very warm long-johns, and is learning how to do things in sub-zero temperatures. In fact, playing in our fridge was just a warm up (cool down?) gig: he is currently looking for someone with a big walk in freezer so he can go and practise at seriously cold temperatures. The Scott Society and various other august bodies support him: it is, after all, such an eccentrically British thing to do. But he does not yet enough sponsorship. And he is too modest to push the enterprise/appeal for help himself. So if you are reading this, there are several things you can do to help. If you work for a big company, simple financial sponsorship would be great. If you own an airline, he still needs help with his fares. If you manufacture cold-weather gear, send it his way. If you own a big freezer and fancy an intimate gig, let him know. Spread the word about this wonderfully improbable adventure. Because the world so needs more improbable adventures. You can contact Jake here.